Patrick McGilligan continues his celebrated interviews with exceptional screenwriters in Backstory 5, focusing on the 1990s. The thirteen featured writers—Albert Brooks, Jean-Claude Carrière, Nora Ephron, Ronald Harwood, John Hughes, David Koepp, Richard LaGravenese, Barry Levinson, Eric Roth, John Sayles, Tom Stoppard, Barbara Turner, and Rudy Wurlitzer—are not confined to the 1990s, but their engrossing, detailed, and richly personal stories create, in McGilligan’s words, “a snapshot of a profession in motion.” Emphasizing the craft of writing and the process of collaboration, this new volume looks at how Hollywood is changing to meet new economic and creative challenges. 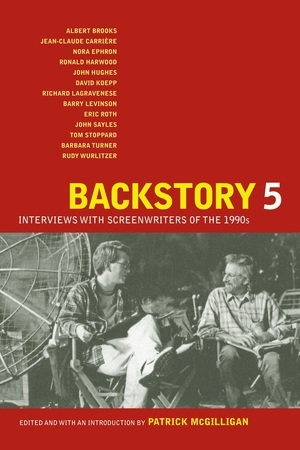 Backstory 5 explores how these writers come up with their ideas, how they go about adapting a stage play or work of fiction, how they organize and structure their work, and much more. Patrick McGilligan, who teaches film at Marquette University, edited the previous four volumes of Backstory, all published by UC Press. He is the author of many books about film, including Alfred Hitchcock: A Life in Darkness and Light and the New York Times Notable Book, George Cukor: A Double Life.